You are here: Tawhai School › Our Learning › Celebrating success! Tawhai School regularly celebrates success and achievement amongst it's young people to build self-esteem and promote desirable behaviour and attitudes. Success is celebrated in a variety of ways. Presented in each class at the end of each day. These awards acknowledge those who have been respectful, responsible or have strived for excellence. Presented weekly at either whole school or syndicate assemblies. Teachers select one student each who has achieved success in any one of the key competencies throughout the week. Presented weekly at either whole school or syndicate assemblies. Students select a class member who they feel has best demonstrated one or more of the school schools values. Sponsored by the Hutt City Council. Assemblies also provide opportunities for students to share examples of their work, recognize academic achievements, acknowledge student leaders, success in sport or the arts. Teachers can also send students to share work with the principal and often receive a special ‘Principals’ sticker for their efforts. The school website is used to celebrate and promote examples of student success through the classroom blogs, news updates and Tawhai TV. 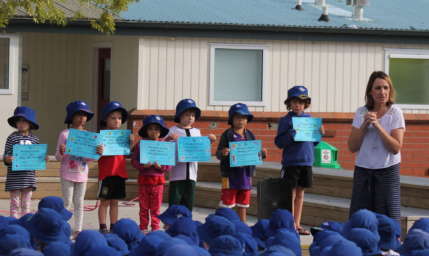 An end of year Assembly is held in term 4 and acknowledges student achievements throughout the year with trophies and certificates. Presented to the top Year 4 and Year 5 student. An end of year formal function, held in term 4, acknowledges the achievements of our Year 6 students with certificates and trophies.